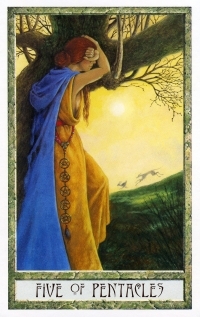 Today's Draw Classic*: Five of Pentacles from the Druidcraft Tarot. Do you suspect your thoughts may be defeating you? Do you generally come from a place of gratitude or lack? And would you rather have more money...or a greater feeling of wealth? Tonight I'm putting together a New Year's manifestation ceremony that will take place during tomorrow's full moon. So when I stopped to pull a card for tonight's draw, I got the Five of Pentacles. Realizing the message I would give was the same as in this post from last February, I'm reprinting it with some revisions. In this week's theme, it's something to consider as we move forward into the New Year. The Five of Pentacles is usually a card of poverty or material loss of some sort...loss of a job, a poorly planned shopping spree or the effects of divorce. More often than not, however, when this card comes up in a reading it indicates a "poverty mindset." This woman wears beautiful, clean robes. She sports a richly bejeweled sash. Her hair is well kept, her skin pristine. She stands at the base of a budding tree. The sun shines brightly on rich, green hillside. In the background a hound is in hot pursuit of a hare. There is no poverty or material loss in this picture...except in her mind. Poverty mindsets can happen to anyone. It doesn't matter how much you earn or how much you have saved. A poverty mindset is more about focusing on what you don't have than what you do have. And once it has you in its grips, it can literally limit any possibility you have of having more—more money, more love, more anything. Given the time and opportunity, one loss, perceived or otherwise, can act like a cancer in your life, penetrating every corner. You literally think your way into depression. And the more you focus on loss, the more you lose. In metaphysics, it's called the Law of Attraction. It's a theory based on the belief that like attracts like. The spiritual piece to this belief is that, whatever you focus on, God or the universe will give you more of. So whatever energies you send out, will be returned to you. Therefore, if you think "I have more than everything I need," the universe will send you MORE "more than everything you need". If you think, "I don't have enough money", the universe will send you MORE "not enough money". After all, if it's what you're focusing on, it must be what you want. Of course, much of it can be attributed to simple psychology. If you practice gratitude, you'll feel more abundant because you'll be focusing on what you have, instead of what you don't have. Conversely, if you focus on what you don't have, you'll feel more lack. Then whatever state you focus on is the one you'll carry out into the world and the one the world will respond to. Would you rather hire someone who feels like a loser or a winner? So even if you don't believe in the spiritual piece, the theory works regardless. If you want to start putting this to work in your life, 1) begin by watching your thoughts and replacing the "negative" thoughts with positive ones. If you're not sure you're wording things correctly, put "I want more" in front of the thought. So if you want to exercise more and think "I need to exercise more", the universe will give you more reason to need to exercise. So a better way of saying it would be, at the very least, "I am exercising more" and, optimally, "I exercise the right amount for optimal physical and mental health." The important thing is to choose the statement you can most buy into and believe in. Personally, I like to choose a thought that includes the word "feel"..."I feel healthy and fit", for example. Because, for me, it's not usually the "thing" that I want, but the feeling that comes along with it. And if you feel healthy and fit, you will protect that feeling by eating and doing the right things. As another example, having a million dollars in and of itself won't make you feel flush. If you win the money, it comes with tax issues and long-lost-cousins-finding-you issues. So asking for a million dollars when you really want to feel like you have more than enough money could actually work against you. Chances are, you want the feeling more than the money. So ask for the feeling and let the universe decide how to give it to you. Then the next piece of this is 2) trust that it's going to happen. Don't obsess over your thought. State it once or twice a day, and then just trust that it will come to you. Then, 3) have gratitude for whatever comes. Sometimes interim steps have to happen before you can get what you want, so trust that whatever comes is in divine order and be grateful for it, even if it doesn't look like you thought it would. Finally, 4) move toward your goal, even if it means just planning at first. But set a plan, send out those resumes, go for that walk, whatever. Like I said, it's a discipline, so if you try it for three days, then fall back into old habits, it's not the principles that didn't work. It's you. If you really want change, you'll take the steps necessary to make it happen. And if you take the steps necessary, you'll be showing the universe you're serious about this and you'll begin to see results. *Adapted from a post made on 2/27/12.